Special Speaker Alert! Neat Iota Xplorer Are Here! The Neat Iota Xplorer - hand crafted by the boffins at County Durham's finest loudspeaker manufacturer - is the new big brother to the smaller Iota Alpha's, which has been one of our most popular little speakers of recent times. Anyone who has heard or indeed owned a pair of the smaller Iota Alpha and hankered after that next step up will adore these. Bigger than the Alpha's and with the same overall shape as them but still not a big loudspeaker by any stretch of the imagination. The Neat Xplorer very cleverly conjures up oodles of extra bass extension (not boom) by using the iso-baric double bass driver trick which fools the drive unit on the outside into thinking that it is in a cabinet that is way bigger than it actually is! Genius or what!! This system is not easy to get right but Neat have well and truly nailed it with this design. It sounds for all the world like they have their own built in subwoofer! 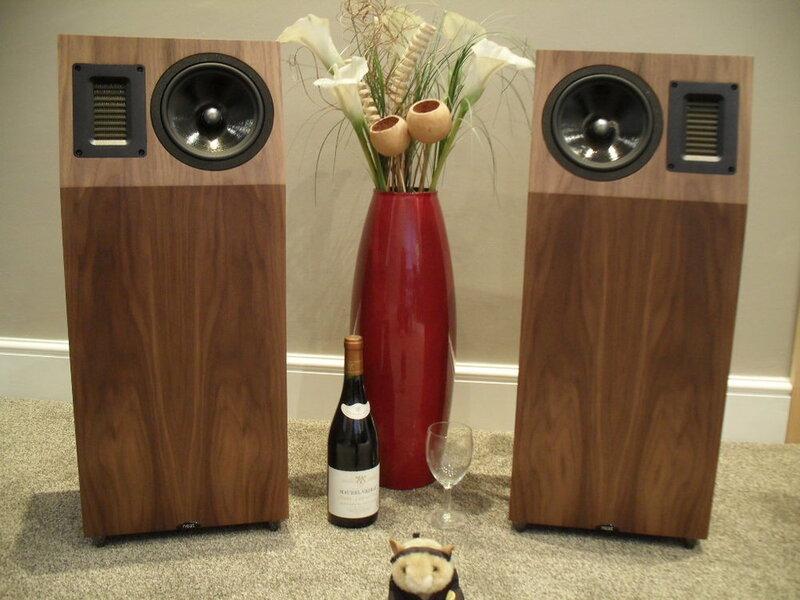 Another big stroke of speaker boffin design genius puts Neat's very own P1-R3 170mm bass/mid range drive unit and the rather grandly named Air Motion Transformer (AMT) together. and are mounted side by side in their own rear ported enclosure separate from the bass units. Designed and built this way to give a cleaner sound with a wider dispersion of the stereo image. The enclosures have a tuned rear port, we have found they work equally as well placed close to the the rear wall or in free space . They are isolated from the floor by some rather smart and very shiny coned spikes. This also keeps the isobaric bass units on the bottom the ideal distance off the floor! We gave the speakers an initial listen fresh out of the box with results that were OK but not great, so we left them on for two weeks running eight hours a day, giving them the best part of 80 hours of quality running time playing a combination of Kraftwerk's Tour De France and Deadmau5's Random Album Title! Going back to them again after all this time they sound like a totally different pair of loudspeakers! My initial thought was "Wow" .... bass was now deep and tight just when it needed to be. Top end now sweet and nicely extended. Mid range now nicely open lending voices that type of expressive detail that makes you hang on every word. The one thing that makes the most difference to the overall presentation of the sound though is how these speakers manage to throw an image way outside of the boxes. It sounds like the walls of the room disappear and you are left with the image of the music just hovering in the air in front of you . a lovely experience and a rare one too! Not many speakers of any size or price can quite manage this! Amongst lots of things I played one of my favourite demo tracks which is Get Miles by Gomez from the Bring It On album. This piece has cavernous deep bass which was very deftly handled by the isobaric bass system but the thing that struck me the most was how easy it was to hear right into the mix. The three vocal parts spread across the soundstage. Drums far left, guitar far right. I was totally sucked in to the music! But then I suppose that is exactly what a good loudspeaker should be doing! Oh and the electronics being used to make all these lovely noises......... the new Arcam CDS50 CD player and SA20 amplifier from the new Arcam HDA range, with my favourite Rega Couple interconnect and Chord Company Odyssey speaker cable ...... but then that's a blog for next time! Why not come in and have a listen and we'll even make you a cup of Audio T.